We conceived UpstateDowntown out of a desire to share our revelations, musings and discoveries about food, wine, travel, healthy living, fitness, country and city life in the Hudson Valley (upstate) and New York City (downtown), where we are lucky enough to live, work and play. We’re unapologetic, pleasure-seeking, health-minded epicureans, with an appetite for style, design and good taste—on and off the plate. We also enjoy physical challenge, whether at the gym or outdoors, and strive for an active life. Note the emphasis on “health-minded”. As challenging as this can be in our fast-paced, convenience-oriented world, we believe in living well. This translates into our passion for local, seasonal and organic food and drink. Over time, we’ve learned that “you are what you eat” and that “less is more” holds true for most quality-of-life issues. We’re committed to leading a balanced, minimally processed life, as best we can. How? By making informed choices when it comes to what goes into—and onto—our bodies, whether it’s food, wine, clothing or cosmetics. Living well is an ever-evolving journey. We invite you to join us. Kathryn Matthews is an independent lifestyles writer, who contributes to The New York Times, O Magazine, Town & Country, RuralIntelligence.com, SNOW and epicurious.com. Her numerous features (on home design, real estate, health, leisure and luxury trends) have also appeared in Prevention, Forbes.com, Portfolio.com, Fitness and Cooking Light. She completed the La Technique culinary program at the French Culinary Institute in Manhattan and has written about food and wine for Bon Appétit, Saveur and, until 2007, the former Kitchen & Cook, a magazine geared toward home cooks, produced by The Culinary Institute of America in Hyde Park, NY. She has been a good—bordering on gluttonous—eater all her life. Fortunately (for her husband), she has been—and is—a disciplined runner. She is married to co-blogger Christopher Matthews. Christopher Matthews, a Manhattan-based press, communications and public affairs specialist, is also an independent wine and spirits writer and educator. He studied at the International Wine Center in New York, from where he received the Wine and Spirits Education Trust’s Advanced Certificate (With Distinction). He is also passionate about gardening, horticulture and bird-watching (especially the St. Louis Cardinals!). Thomas and I really enjoyed your blog. It definitely defines who you both are:) Two people who are passionate about life especially when it comes to food and wine with a focus on “health minded”. I have been perusing UpstateDowntown (very clever) and enjoyed “A Tale of Two Yards” and am thinking of using the “Happy Cow” chili for our next bridge club gathering. 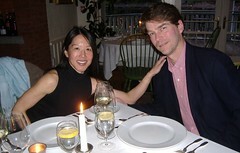 Happy Valentines Day – curious to see where you two will have your Valentine Dinner.